NOTE: To facilitate the readers, the last updated text will be written in red color. Well, the 2010 starts with the increase of 12x owners. Due to this reason (and following some LPF members suggestion) hence the decision to start a new thread for the "12x" BR Owners data collection, to open for them a dedicated space also in view of future 12x diodes improvements. 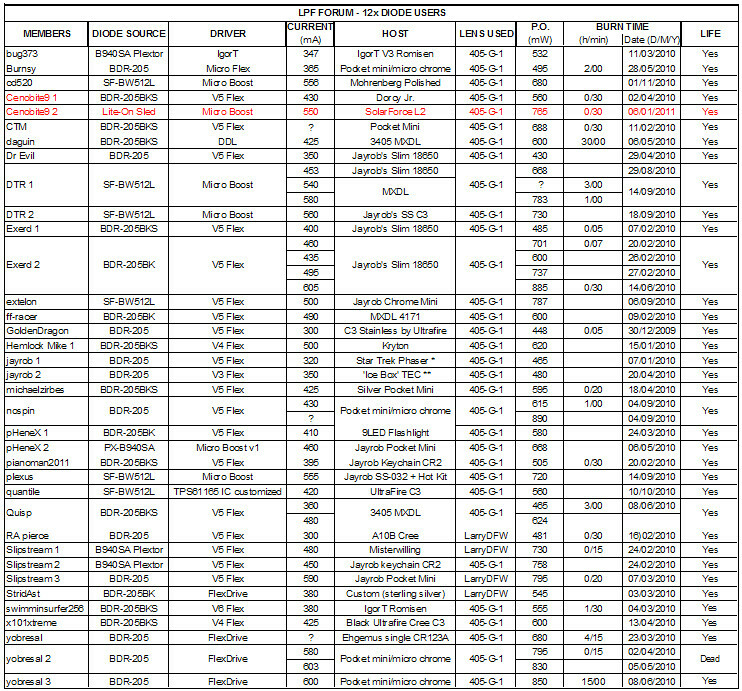 So, hereunder are the datasheets of all the 12x Owners, further updates will be implemented here. That is the correct drive. However, you can get them on eBay now for ~$205 shipped. Alright sweet. Thanks for the info. Those 205$ ones are new correct? Yes. They are new. Just search "BDR-205" As with all eBay sources, you will find different prices. If anyone orders the 205 drive, I will purchase the small 3.5mm red diode from that drive if you don't nee it, send me a pm if you're looking to sell it. Well, they are, but are you willing to shell out >$1000 a piece? 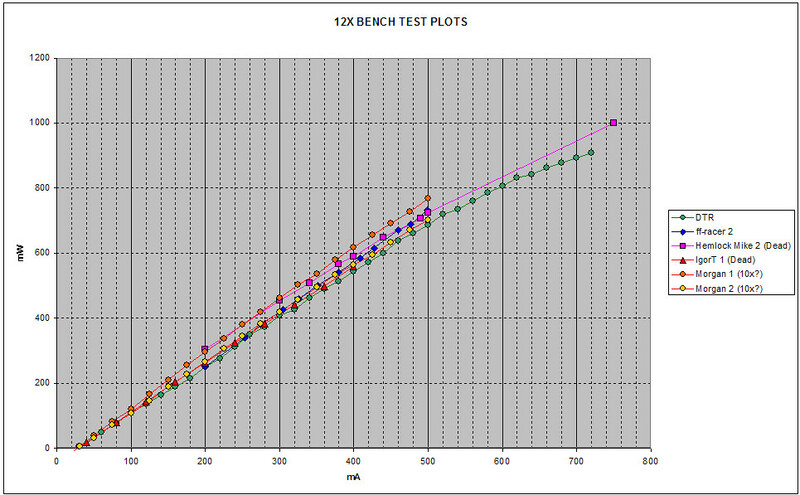 Here is a graph from Nichia on their 320mw 12X Blu-Ray diode. And we know their instrumentation is accurate. When I drew their graph in your chart, it overlapped with the Quisp datapoint. 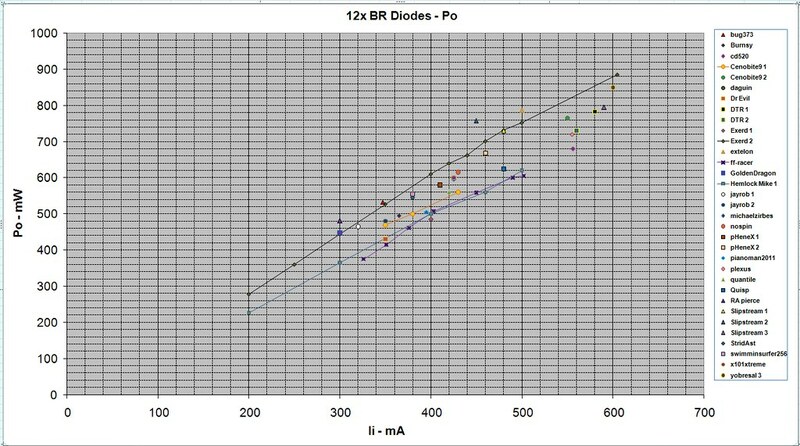 Well, taking into account Nichia plots, just to make some simple valuations, Nichia mW/mA ratio is 1.23, while Quisp ratio is 1.29, so il looks that his diode "relevant efficiency" is better. The current values in comparison (260mA and 360mA) give a 38.4% of current increase, against a P.O. (320mW and 465mW) increase of 45.3 %. You are getting different slopes than I did. The threshold current must be subtracted from the current reading to get the slopes reported in the diode data sheets. I estimated the threshold currents to be the same. I took (Power out / Current In - Threshold Current). I got 1.42 mw/ma for the Nichia. I got 1.43 mw/ma for the Quisp diode. That is only a 0.7% difference. I can't wait any longer --- I just ordered a BDR-205 for $203. I know how you feel. I have one here in a baggy . . . . taunting me.